A couple years ago two of my friends came up with one SIMPLE idea. They ran with it and quickly turned their idea into over $1.4 MILLION in income. 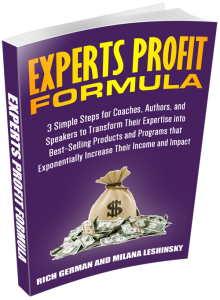 In addition to sharing their story, this report also reveals exactly how you can turn your coaching expertise into a 6 or even 7 figure business. I just finished reading the report… It’s a quick, easy and extremely valuable read. I highly recommend it! I love how they map out the big picture of their game-changing approach while also providing practical strategies you can use right away. For example, on Page 11 they reveal their fool-proof formula for creating Sizzling Hot Titles for your coaching programs or products. This alone is worth the opt-in. And then post a comment below and let me know what part was most useful for you. I’m curious to know!